Whelp folks, this old dog of ours has officially entered a new stage in life. 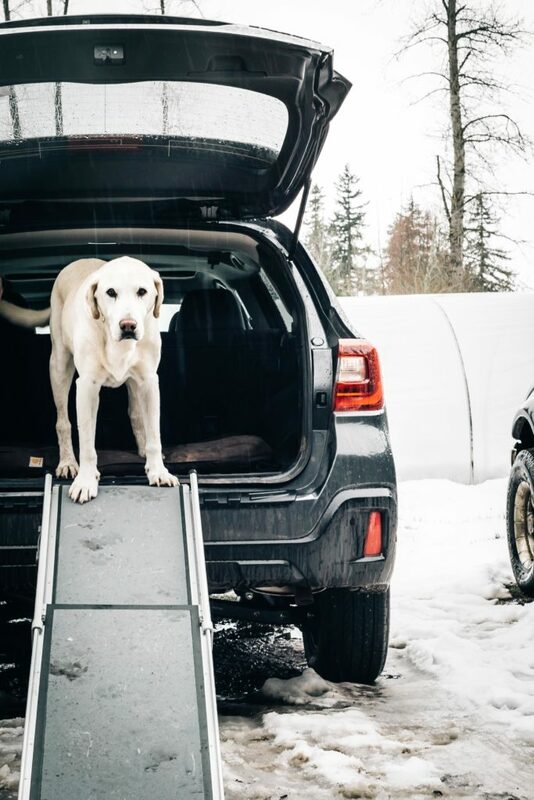 He now needs a ramp to get in and out of the car. Luckily he’s still able to run farm errands with us, drop off veggie deliveries and of course, keep his eye out for treats at the gas station pump. He’s still happy, healthy and riding in style in the back of the Subie. We love this guy with all of our hearts and know he’s still got a few strong years left in him. If you’ve been reading this blog for a long time you already know that I am very (very) particular with brands that I work with. It’s something that I hold very close to my heart. This blog has grown (like a LOT!) in the past nine years. I can’t even believe I’ve been blogging for nine years, but damn, here I am, still fighting for the same thing. Good food, great company and a community that makes me feel at home. Through this little space I’ve been able to connect with some great like-minded folks and have had opportunities to work with specific brands that are in line with my same core values. It’s been a total trip, but a fun ride for sure. So, when the amazing folks at Subaru reached out to see if I would partner with them for a year I thought, ABSOLUTELY. 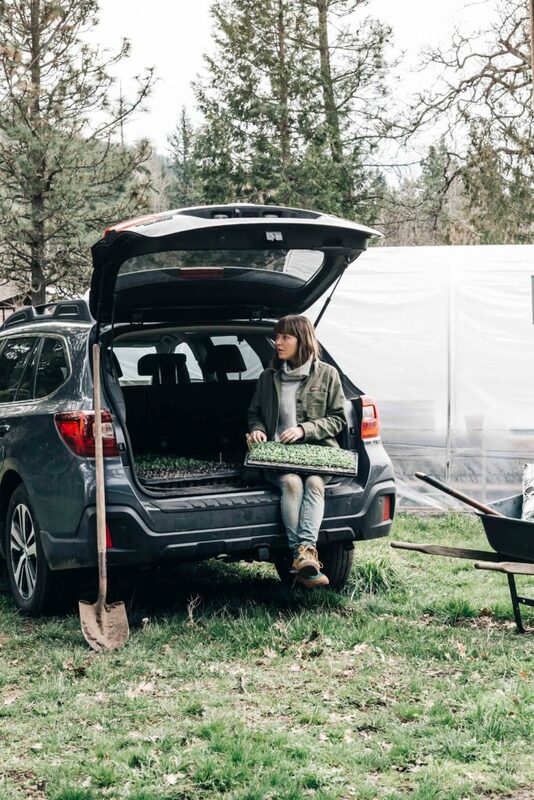 We need a reliable vehicle for our business and Taylor and I have both been proud Subaru owners on and off most of our lives so it seemed like such a natural fit. 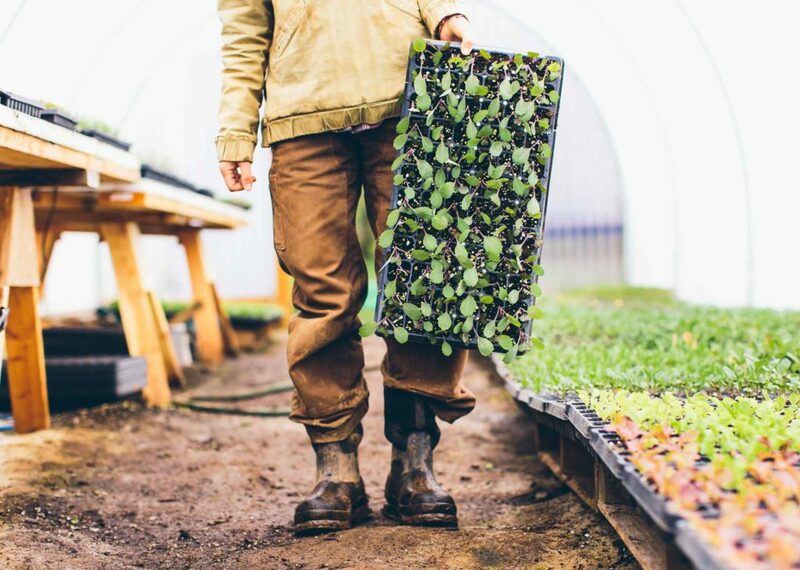 Besides, I’d already cultivated a great relationship with the company through my collaborative farm-to-table dinner with Joshua McFadden (you can read about that here) and my wild trip through west, Texas this past winter. You can read about that here. So now the Subie is our main farming vehicle and it’s working like a charm. When the greenhouse gets too warm we move outside and transplant in the back of the car (I always love an excuse to sit down while farming!) And it tows the Tumbleweed Farm trailer like a dream and even proved to be a safe ride when we picked up our piglets from another farm last week. I know what you’re thinking and yeah, we lost that “new car” smell pretty quickly. But it was a safe haven for the newest additions to the farm and it made for an adventurous ride, that’s for sure! The good news is that I think the ladies (they’re all girls–just like last season) are settling in well and are happy at their new home. 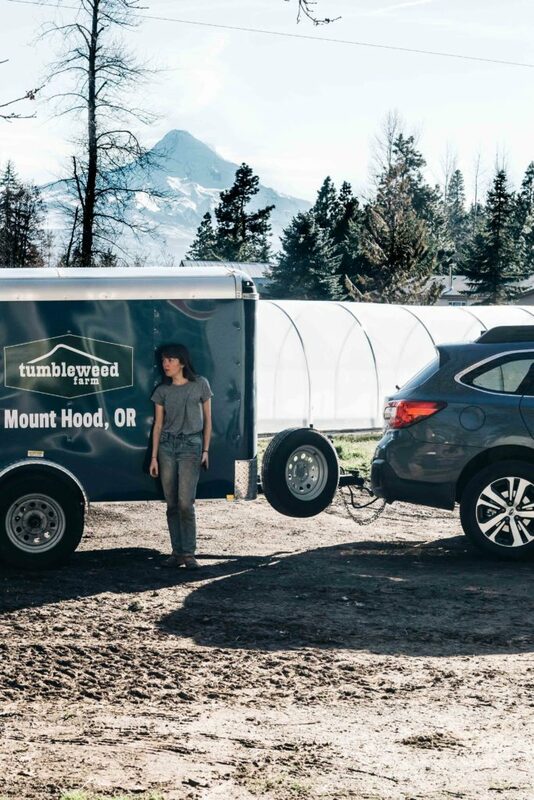 A Subaru may not be the kind of car you typically think of as being practical for a couple of farmers, but as it turns out, it’s the perfect vehicle for Tumbleweed. 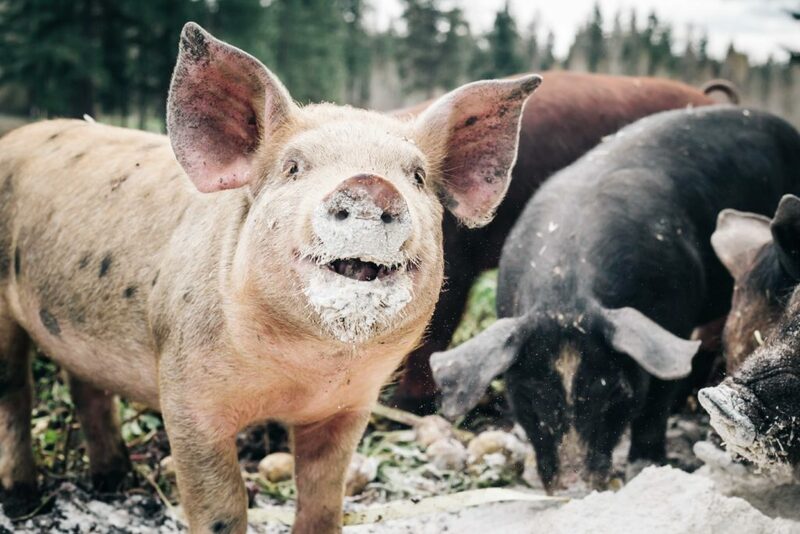 We’re hoping that with a reliable car, healthy soil, productive plants, and happy pigs that we’ll have a good season on the farm. 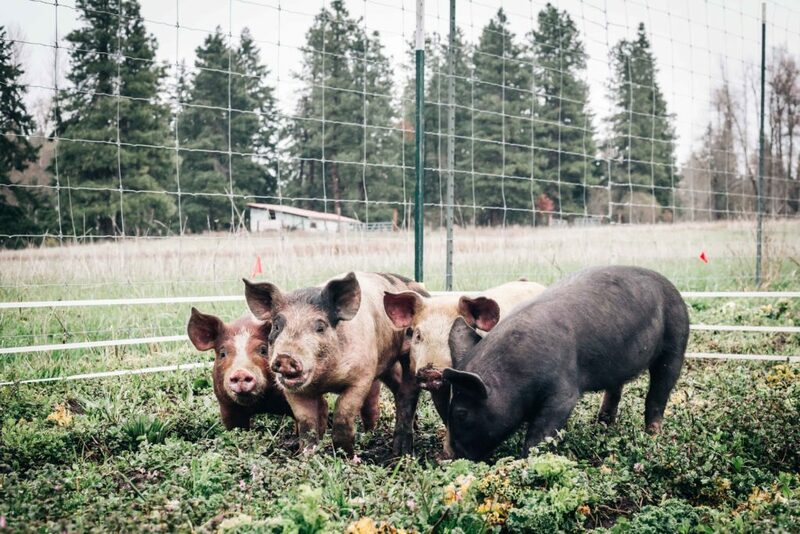 The above photo is taken at Treebird Organics Farm where we picked our pigs up from. 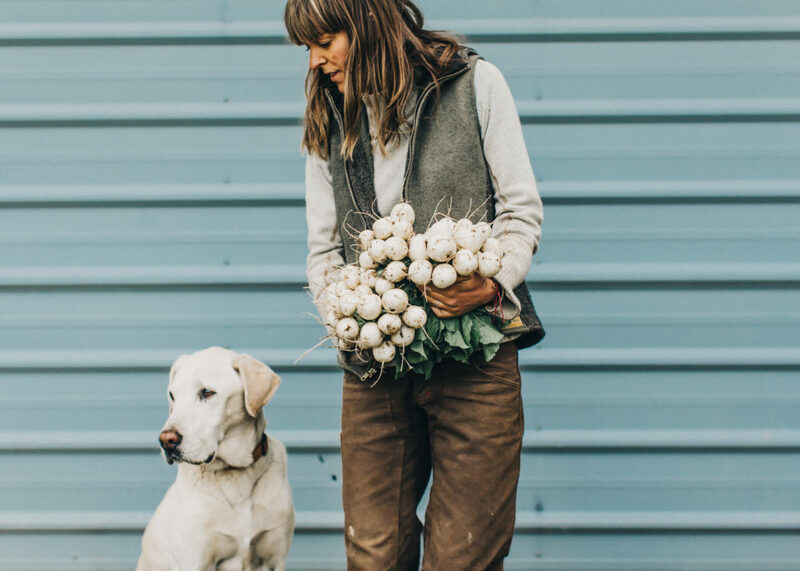 It was awesome to see their operation and we’re so happy to support other small farmers working their tails off to provide food for our community. Thanks again for everyone who has followed us along since the very beginning and for those of you who are just tuning in for the first time. 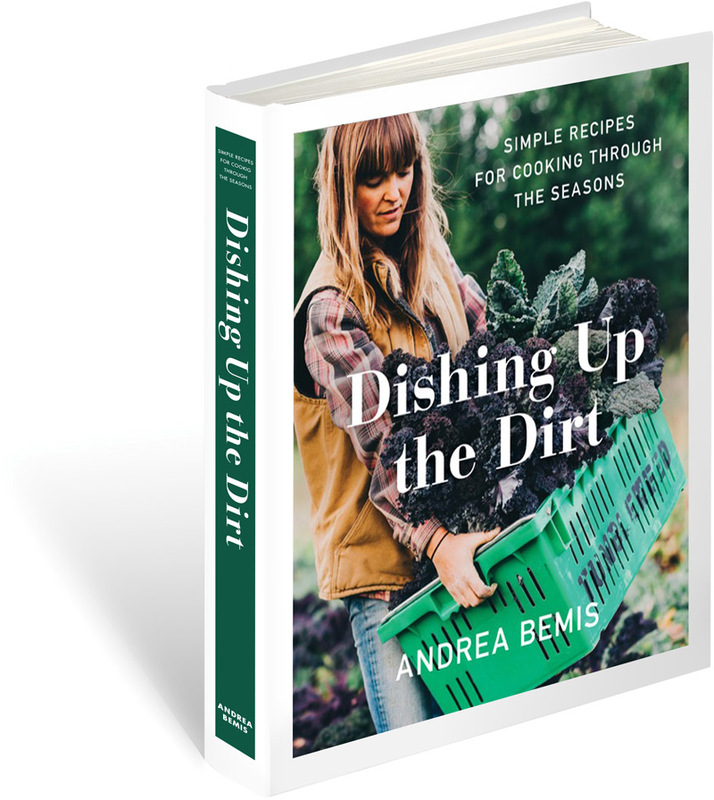 I hope you continue to enjoy the farm updates and tasty recipes. If you need me, I’ll be spending my days in the greenhouse which is a happy place to be on these rainy days at the farm. You folks remind me of me when it comes to growing veggies. Starting in 1990 when we moved from Maryland, outside of D.C., with my 2 girls moved into what had been my parents retirement home. With the help of my 2 daughters we showed our neighbors what city girls could do with 100′ to 40′ of turned soil with cow manure (from our fields) tossed in. Every third row were flower beds so to bring on the honey bees and humming birds. I so loved playing in the mud and acting like Santa Claus, HO HO HO! with the hoe. Now that I am in my 70’s gardening has become more of a issue for what I once did in one day now takes me three or four days to do. I so hope you both won’t have this problem. 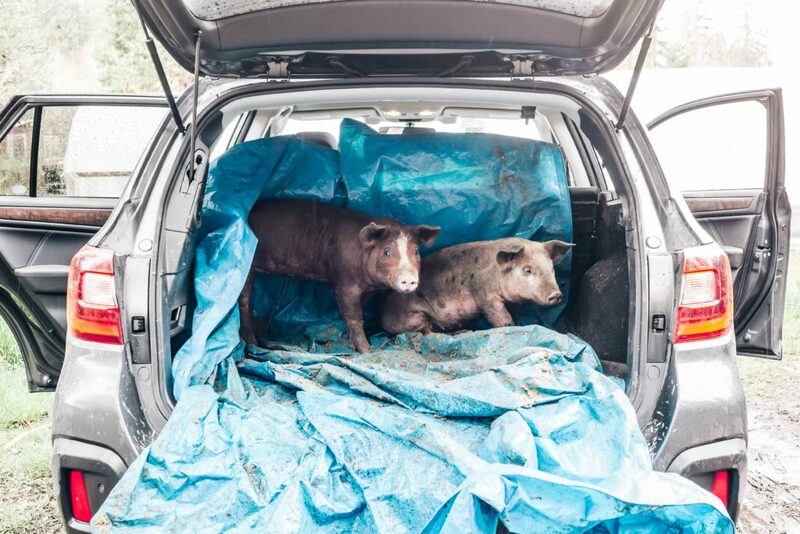 As for having my own meat on four legs … they all would have names and I would be doing body slams on their gates so not to let others take them to the butcher. Awesome! Congrats on expanding your garden! Happy growing season. Such cute pigs. You just got them? Are they for pets or do you raise them to slaughter them for meat? Thanks for the comment Pam. We don’t raise pigs as pets. They provide us with meat in the wintertime when our farm isn’t producing enough veggies to sustain us. I hope that’s helpful. …so why do you have dogs as pets then? They are both sentient beings that deserve to live. do you realize how hypocritical that is? Been wondering how old Henry is. 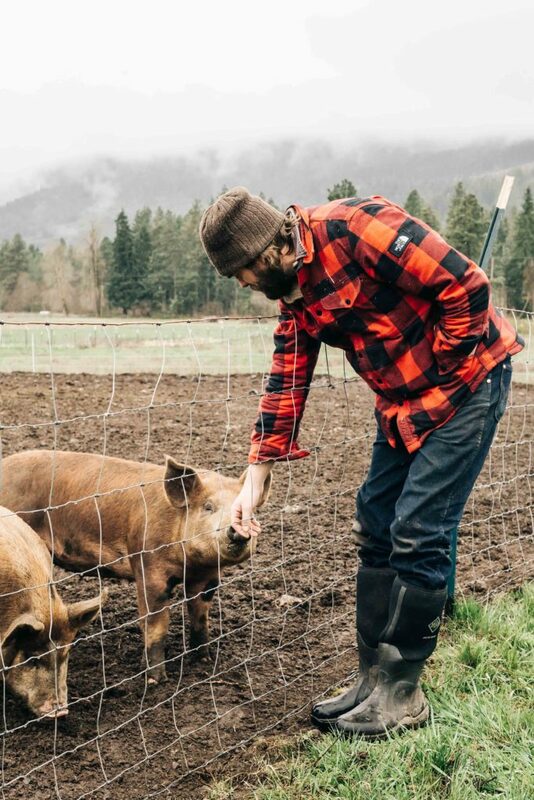 He seems like such a happy farm companion for you and Taylor and I love seeing him in your photos. I am a huge Subaru fan, too. We’ve had 5 so far and will be racking up another one by year’s end. Thanks for being such an inspiration for great recipes and also for giving me an appreciation for what it takes to get that food to my table. my car just died and I hate it as I love it but it is 18 years old and so putting money into it is not a smart plan! I am looking at Subaru’s – a cross trek possibly! Cute picture of those piggy’s ! BOTH of our cars about to go and I’m just praying they hold on a bit longer! But I am very excited to try a Subaru next. I’m glad they would work well for towing my *dream* camping trailer! Just got on board. Think you guys are awesome.